I'm always happy when someone introduces a new ugly species to me. After nearly four years of daily blogging, it's good to know there's still more material out there. Courtney introduced me to the Russian desman. 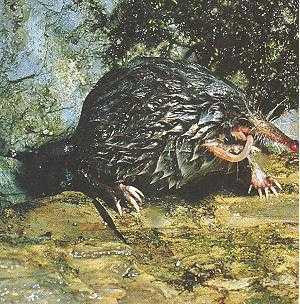 They belong in the mole family, and like their cousins, they are functionally blind insectivores. However, these creatures come equipped with laterally-flattened tails and webbed feet. That's right; they're aquatic. How do they find their prey? Like other moles, they come stock with Eimer's organs -- sensitive touch organs at the tip of their bi-lobed snouts. Like the good toucan says, they follow their nose. Their wild populations have been on the decline for decades, but seem to be on the rebound recently, thanks to stricter enforcement of Russian laws protecting them. One thing you can do to help: don't buy desman fur coats. Or, if you do, buy them secondhand. No one will notice the cigarette and stale perfume smell from the old lady you bought it from. 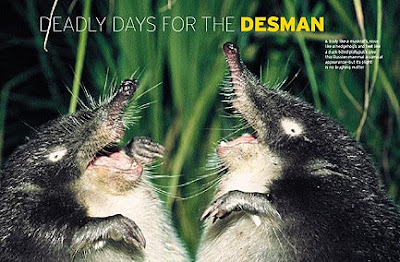 Thanks for the desman, Courtney. That second picture reminds me of two politicians laughing about how they just screwed the electorate and got away with it.